Stevo Poulin is a problem. Although he's only 8-years-old, this champion wrestler from Schuylerville, New York has become the latest YouTube phenomenon thanks to a two-minute video that features the pint-sized grappler destroying hapless opponent with the same raw power and electric intensity as Brock Lesnar. Sporting a serious Mohawk and surprising strength, Poulin already has a clear grasp on all the basics of mat wrestling. But what sets this elementary school assassin apart is his ability to intimidate. 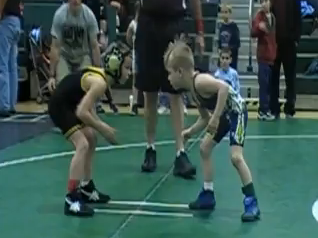 Watch the way the little man bounces on his feet before the match starts like he's trying to suppress his desire to prematurely pounce on his opponent and be thankful that you never ran into a kid like Stevo Poulin when you were in second grade.